The term “Tax Technology” doesn’t seem quite right anymore. It’s sounds too one-step-removed, like technology is “over there” and it can be dismissed as is someone else’s problem. Maybe calling it “Technology in Tax” is better, because 2018 stands to be the year when the business of “Tax” becomes indistinguishable from the technology that underpins it. This heralds a sea-change in approach. As 2018 arrives, it’s hard to fathom all the influences on corporate Tax departments. Change is everywhere and it’s deep, going beyond simple technology encroachment. Let’s have a brief look. Besides politics (US tax reform, GCC, India and the European Commission, to name the main ones), SAF-T, SII in Spain and a number of advanced developments in Latin America exist only because technology can now support it. More is coming. The boundary between tax and technology is increasingly blurred. CIOs don’t want to be CIOs any more. Cloud and hosted super-solutions (such as Microsoft Office 365) mean that when it comes to data centers and IT operations, to quote Duke Ellington, “things ain’t what they used to be“. Now CIOs want to be CDOs (Digitalization) or CTOs (Transformation), finally climbing down from their IT ivory towers and making technology work for the business! This is long overdue. C-suites are driving Tax to be better and give more information. Tax may have previously been spared from search for growth through productivity, but no longer. While the long-standing financial performance pressures remain, Tax must now add productivity pressures on top. Tax leadership that deems success as ‘getting by’ on a small spend is on its way out! This is good news, and again, overdue. Consequently, that well-known gap between Tax and IT is also changing in nature. This is reflected in the often-quoted prediction that most Tax jobs in future will be tax technology jobs. However, this doesn’t mean that traditional Tax people must learn traditional IT skills or vice-versa, at least not entirely. Instead, key capabilities will revolve around enterprise data and those of designers and solution architects. Neither Tax nor IT backgrounds of the traditional kind are ideal preparation for this. Therefore, alongside an inflection point for ‘Technology in Tax’, we predict a breakout year for Tax Technology Insights. While an enlightened approach to Tax engines and compliance tools have become mainstream (with varying degrees of success), how does RPA (“bots” are moving into early majority), AI (still limited and with early adopters), dedicated tax data tools, and even SAP HANA and ERP Cloud fit into this picture? The only place for an independent, in-depth, behind the scenes viewpoint, with appropriate training is here. Don’t miss this vital conversation. Check it out and sign up for free. 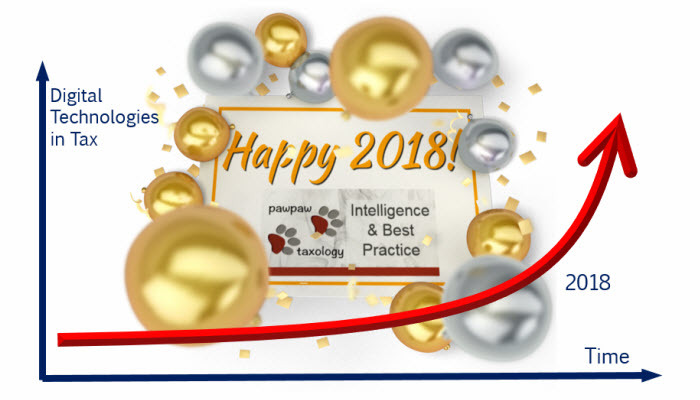 By the way, the term “Tax Technology” will be around for a long time yet, but in 2018 we want to take it to a new level of understanding and engagement. It will be a great year! Office 365, HANA and ERP Cloud are all either registered trademarks or trademarks of Microsoft Inc., SAP SE, and Oracle Corporation respectively and/or their affiliates in the United States and/or other countries.